As the industry gathers for its major trade show, reports from the field are that business is picking up. These days folks seem wary to speak of good news, fearing such talk might jinx brightening prospects or, worse, invite bad news. The effects of the September 11th, 2001 terrorist attacks were so terrific on the U.S. (indeed, the world’s) economy, and the aviation industry in particular, that no one dares raise the spectre of a repeat. Yet, if rotorcraft manufacturers, maintenance shops and analysts are to be believed, the news does seem to be good. 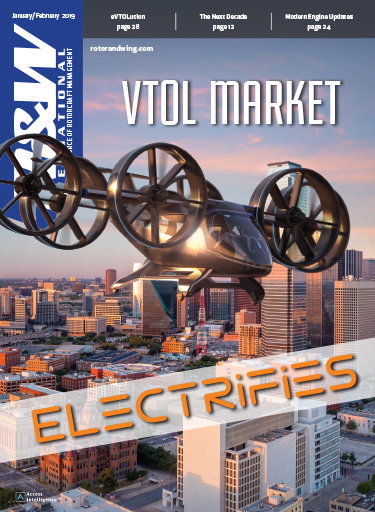 As the rotorcraft industry gathers in Las Vegas this month for its main trade show, the Helicopter Assn. International’s annual Heli-Expo, March 15-17, business seems to be picking up. “If you are going through hell,” Winston Churchill once advised, “keep going.” Since September 11th, industry participants, like many others around the world, have heeded Churchill and kept plugging on. That perseverance may have paid off; we may be reaching the end of that journey out of hell. 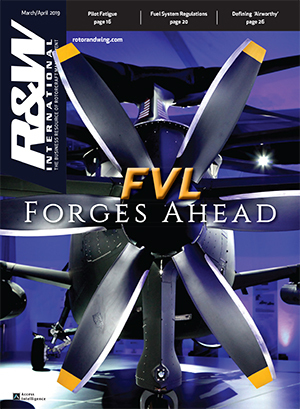 “We’re very bullish on the market,” said David Ford, chief operating officer of Keystone Helicopter Corp.
With the financial backing of the Ranger Group, the West Chester, Pennsylvania-based maintenance, completions and flight services company has been investing in new facilities and capabilities and hiring employees. Keystone recently moved its engine overhaul center into a new facility, Ford said.ï¿½ Over the next year it plans to shift all operations into the site, which will be twice the size of its current set-up. The rationale of all that was to position the company for the inevitable upturn in business, Ford said, and signs are that upturn is here. “Flight hours were up in 2003 over 2002, and all indications are that this is a trend that’s going to continue into 2004,” he said. By the company’s numbers, more helicopters are entering the active fleet than are leaving it, and civil customers–especially corporate operators–are showing greater interest in equipment and technology upgrades. Add to that the fact that the weakness of the U.S. dollar compared to other currencies is making U.S. products and services more of a bargain for overseas customers. Keystone and a number of other maintenance and completions shops report that they are getting more requests for quotes from customers, and that more of those requests are being converted into work orders. The requests run the gamut, from major interior work to component overhauls to painting to avionics upgrades. Heritage currently is working for Erickson Air-Crane on getting certification to convert its firefighting aircraft to a glass-cockpit configuration. This is to support a sale of those aircraft to Italy. Heritage will be displaying the instrument panel for that conversion at its booth at Heli-Expo. “It’s a long-term contract,” Livezey said of the work. Among the other work Heritage has in the shop is a major avionics upgrade of Super Pumas for an undisclosed customer. For some whose civil business remains soft, greater demand for services and parts from military customers is more than making up the slack. Composite Technology, Inc., also in Grand Prairie, Texas, is in that camp. 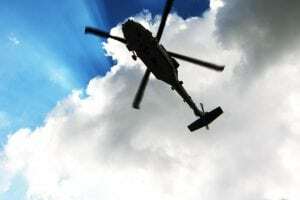 The blade repair company’s president, Michael Topa, said civil helicopter work in the U.S. dipped after September 11th and has yet to recover. That has been offset somewhat by demand from Europe, despite a downturn in North Sea operations. Likewise, business in Brazil has been been growing steadily, spurred in part by offshore support activities. But military business is booming, he said. CTI has recently won a follow-on contract to modify main rotor blades for AH-64 Apaches to correct a delamination problem. In addition to that follow-on for repairs to 70 blades (the original contract was for about 145), the company is selling the modification kits to U.S. Army depots. A contract to modify 3,300 Apache tail rotors to correct premature failure related to foreign object damage led to a contract from a foreign government to see if those mods could address erosion problems on the tail rotors. Longer term prospects for the industry also seem to be improving. Rolls-Royce sees the light twin market as remaining a strong growth segment and turbine singles continuing to sell well despite continuing moves in Europe to introduce regulations favoring twin-engine operations over built-up areas. 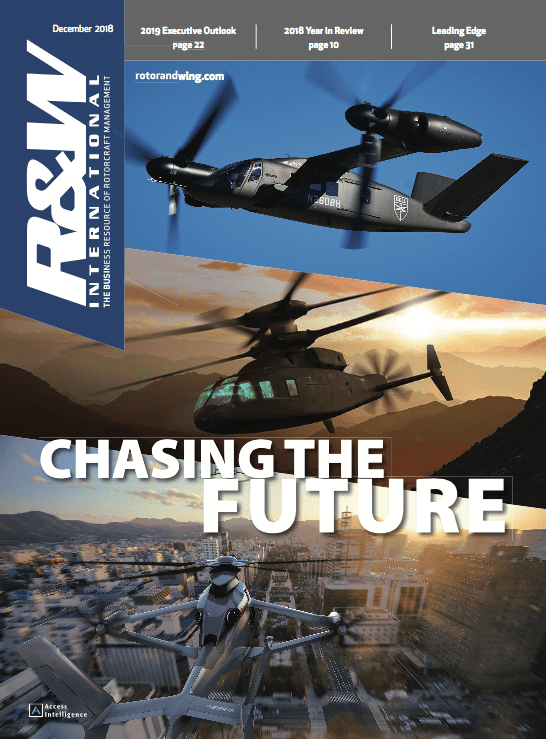 The intermediate twin market continues to see significant interest, the company said, with the Sikorsky S-76C enjoying a resurgence in orders and the Bell Agusta AB139 expected to continue this trend. 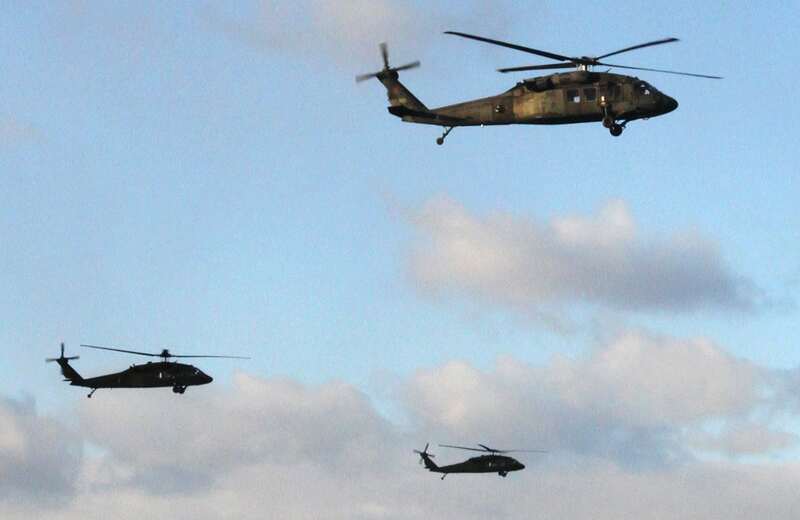 Dave Lawrence of Aviation Market Research LLC, whose data on the civil market has been used extensively for HAI’s Helicopter Annual, said much of the helicopter sales spike in 2003 can be attributed to piston-powered equipment, particularly Robinsons. “This is the highest numbers of piston-powered sales in the last 15 years,” Lawrence said. He attributes the surge in piston sales to deferrals of orders after September 11th that have since been resurrected. More than 900 piston and turbine-powered aircraft will have been delivered worldwide in 2003, he projects. As to the future, “I look for decreases in light piston and turbine powered equipment for 2004 and the next few years,” said Lawrence He says those sizable orders in 2003 from offshore operators, like Air Logistics, are for deliveries after 2004. Over the next 10 years, Lawrence said, offshore oil operators will “pretty much replace their entire fleets.” A principal beneficiary of new sales to offshore oil operators could be the Bell AB139 because of its size and performance, he adds. Further, he said, the market for civil single-engine turbine equipment will diminish somewhat, Lawrence said. Post-recession wariness is one reason. But sales also have been sluggish due to the regulations in Europe and elsewhere that prohibit single-engine aircraft from flying over cities, he said. Richard Aboulafia of the Teal Group gave a brutal assessment of those smaller helicopter manufacturers vying for marketshare. Kaman Aerospace’s president, Joseph Lubenstein, took issue with that. He said the company has been aggressively marketing its K-Max aircraft and investing in new manufacturing facilities in Jacksonville, Florida. The company also has been working with the U.S. government and other governments on possible applications for the K-Max. The Indian air force is interested in the possible use of that aircraft for operations in the Himalayas, and it is likely the company will demonstrate the aircraft in India this year, Lubenstein said. Among the hot topics of discussion at Heli-Expo this year will be potentially threatening regulations, access to air space, and tort reform. Threatening regulations include the FAA’s notice of proposed rulemaking to mandate a higher level of safety for air tour operators. Prompted in part by a series of helicopter accidents that led to a special regulation for Hawaiian air tour operators, FAA wants to consider a national standard under a new designation, Part 136, also known as The Air Tour Safety Rule. This would put greater restrictions on helicopter and fixed-wing operations that operate under Part 135, HAI President Roy Resavage said. Among other things, the proposed rule would required fixed floats or an inflatable floatation system for single-engine helicopters or multi-engine equipment that can’t achieve 1,000 ft. AGL on one engine. The proposed rule also would require a performance operations plan that determines maximum gross weight and center of gravity limitations, a passenger briefing for overwater operations, and life preservers for all passengers and crew. The FAA (and the NTSB) argue that SFAR 71 resulted in a reduction in accidents and therefore should be applied broadly. HAI believes Part 136 would be overkill. Helicopter accidents are down because “there’re fewer engine failures” than a decade ago, Resavage said. The proposed Part 136 regulations are part of a two-year review of existing operating rules by FAA’s Part 125/135 Aviation Rulemaking Advisory Committee. The Rotorcraft Issues Group of that advisory panel will hold a public session in Las Vegas to discuss that and other pending FAA rule proposals affecting rotorcraft. 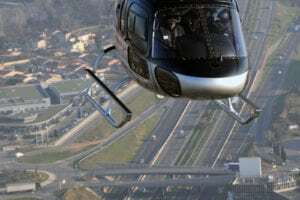 So far, the advisory panel has recommended several changes to the Part 61 flight training regulations and Part 91, under which many helicopters operate. One proposed enhancement to Part 91 concerns the use of night-vision goggles (NVGs) for approved commercial operations, particularly EMS. HAI’s Air Medical Services Committee may host an in-depth briefing on NVG use by an official from FAA’s Rotorcraft Directorate. Petroleum Helicopters Inc., a leading provider of EMS and offshore charter service, and other HAI members, have contracted with Aviation Specialties Unlimited (ASU) to conduct NVG training, according to Bill Wallace, the FAA’s national resource specialist for rotorcraft. (Bell Helicopter Textron also provides NVG training.) So far, five EMS operators have been certified for NVG use. Another safety-related technology bound to generate interest in Las Vegas, according to Richard Wright, HAI director of safety and flight operations, is the Obstacle Collision Avoidance System manufactured by Norwegian firm OCAS-AS. This system “doesn’t require any investment by the operator of new onboard equipment,” said Bob Feerst, former chairman of HAI’s Utilities Patrol and Construction Committee, who is to brief attendees on the novel system. Feerst also will teach his popular course on flying in a wire environment at Heli-Expo. Access to air space and the further shrinking of no-fly zones created after the September 11th tragedy will be covered during this year’s Heli-Expo. Congress has requested studies from the General Accounting Office (GAO) on the need for additional restrictions for fixed and rotary-wing general aviation aircraft. The issue concerns HAI, which plans to work with GAO and related House and Senate committees on any proposed restriction. Resavage also plans to raise the issue of the crippling effects of rising liability insurance. Since September 11th, liability insurance has doubled, eroding much of the profit margin for many HAI members, most of whom operate two to four helicopters. HAI supports the passage of legislation to bring down the high cost of liability insurance. Hull insurance has remained relatively steady, but liability insurance has “skyrocketed,” he added. Resavage plans on renewing the call for tort reform during this year’s meeting. HAI’s Insurance and Legislative Committees are likely to cover the topic as well. HAI’s legislative department will likely brief attendees on compromise language contained in the Fiscal 2004 Defense Authorization bill affecting the aerial firefighting industry. The compromise language requires the government to consider procuring civilian services if a review of the firefighting capabilities of the Air Force and the Air National Guard Modular Airborne Fire-Fighting Systems proves them to be inadequate. The original language to the House version of the authorization bill (H.R. 1588), added by Joel Hefley (R-Colo.) and Elton Gallegly (R-Calif.), would have allowed those military branches to fight fires without comparing the cost of such an effort to the cost of hiring civilian services. Instead, the new language calls for an Office of Management and Budget study and report to Congress to determine whether existing law allows for the activation of Air Force and Guard firefighting units when commercial resources are not available. HAI officials expect the issue to “heat up” in the spring. Among the rotorcraft expected on center stage at this year’s Heli-Expo will be the Eurocopter EC155, Bell Agusta AB139 and Sikorsky’s S-92, which will soon enter scheduled service with Norsk Helikopter of Norway. Norsk has ordered four S-92s for offshore oil shuttle service at a cost of $15.5 million each. Either a 19-passenger S-92 shuttle or a VIP mockup recently displayed at the Dubai Air Show will be in Las Vegas, according to the company. 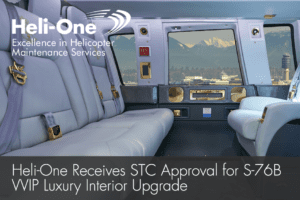 A corporate configured S-76C+, which comes equipped with a quiet cabin, may be displayed. Bell plans to exhibit the Bell 412EP and the Bell 407. 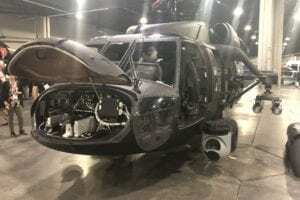 On static display will be the Bell 430 for homeland defense, the Bell Eagle Eye tilt-rotor UAV and possibly the Bell 427 EMS and corporate mock-ups of the 427. Eurocopter said will have the following products on display in Las Vegas: the EC120, AS350, EC130, EC135, EC145, and EC155. Demo flights for certain rotorcrafts are planned during Heli-Expo, but it has yet to be determined where and when those flights will take place. Avionics manufacturers are expected in force as well. 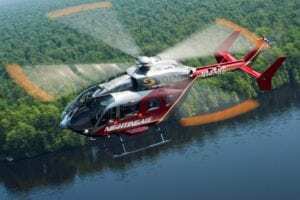 Honeywell said it may display its $49,500 Mark XXII and smaller Mark XXI Enhanced Ground Proximity Warning Systems at Heli-Expo. Goodrich’s proven $17,900 SkyWatch and the more powerful $24,600 SkyWatch HP active surveillance systems are expected to be displayed at the Convention Center. A passive traffic collision alerting device system offered by Ryan International, the 9900B and that company’s 9900BX active traffic advisory system also may be there. A few avionics manufacturers may reveal plans to someday link with the Automatic Dependent Surveillance-Broadcast (ADS-B) air traffic service. More than 12,000 attendees and 450 exhibitors, which would occupy more than 1,300 booths, had registered by late December. Last year, in Dallas, there were 12,877 attendees and 473 exhibitors. HAI expects to best last year’s attendance figures, which would further indicate that the industry is recovering.